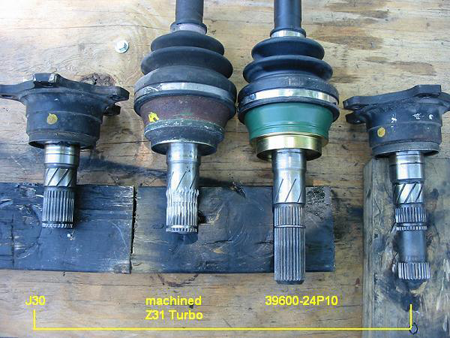 Here is the write-up for equipping your Z31 with a Viscous Limited Slip Differential using hybrid half shafts written by Z31performance forum member Mike_Gruizinga. This write-up describes five ways for the budget-minded DIY’er to build hybrid half shafts to fit the Z31. The write-up consists of two basic parts. One part gives information on swapping the VLSD carrier into the R200 Long-Nose differential housing. The other part gives information on assembling the hybrid half shafts needed to complete the installation. I recommend reading the entire write-up before even thinking about starting this swap. 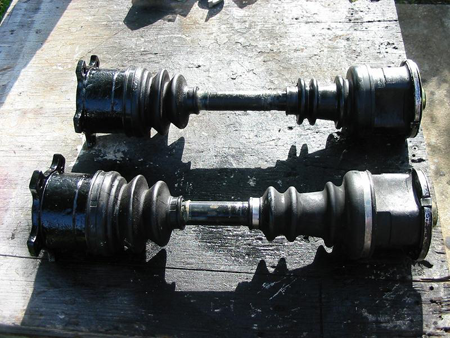 If the hybrid axles are made using methods 1,4, or 5, it will become apparent that they are a bit longer than the original Z31 axles and are a very tight fit when being installed. 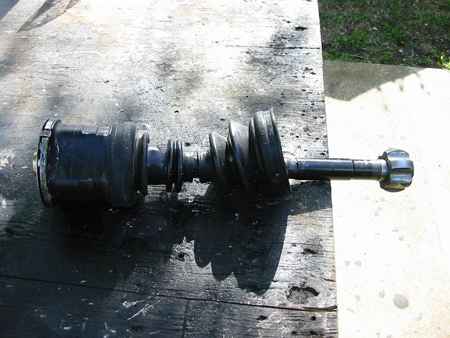 This is due to the additional length given by the inner CV joints and VLSD input shafts. There are a couple ways to help fix this problem. The first two options are good, but I highly suggest the third option if you want the job done right. If you are using T-T axles, cut down the positioning springs at the ends of the joints. 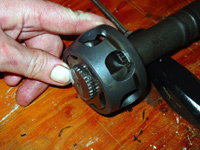 If you are using BDO axles, turn the outer races of the CV joint around. 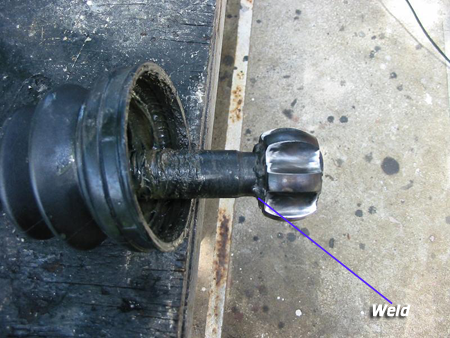 Using either CV joint, bring the inner race (BDO) or spider assembly (T-T) about 1.5 inches closer to the center of the shaft and weld it into place, making 100% sure that the moved item is centered on the shaft. It is a good idea to chamfer the welding areas in order to get deep, strong, and clean welds. Cut the remaining shaft material from the end. This will require delicate grinding and welding, but it can be done correctly and effectively. I did mine with an angle grinder and a MIG welder. Since most R200V differentials are short nosed (unless you have the 88SS R200V) you will need to swap it's internals into your Z31 long-nose housing. I decided to shim my VLSD while I had it apart. I installed one extra standard (.80mm) size shim. Here is a list of the available shim sizes. Each costs about $6.00. There are several (about 10) large bolts holding the crown wheel on. To remove these I'd recommend a decent vice and large prybar or a air gun will work as well. 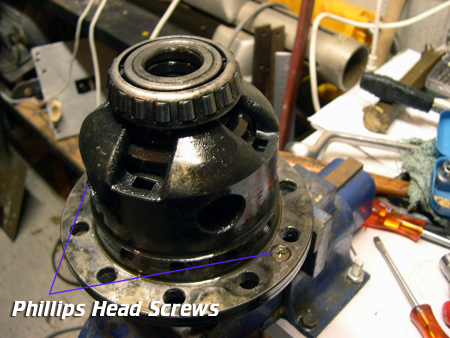 Once the crownwheel is off, you will see 2 large phillips head screws. Remove these and off comes the viscous center. Now pull apart and you will see a washer sitting on a flat surface. 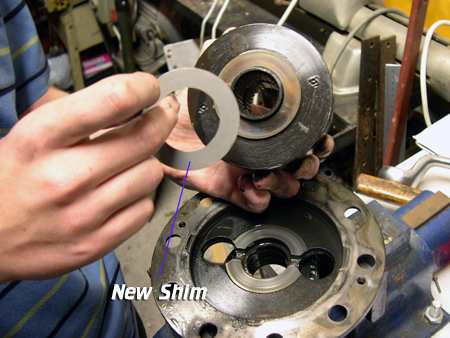 That's your original preload shim.See below for a rough indication of what it looks like in new form. See below for a rough indication of what it looks like in new form. Now the original plan was to double that thickness and put more load on the viscous center, somewhat 'reviving' it to how a LSD should be. If you're me however, 1 extra shim just isn't enough for drifting (it is great for everyday driving however). So go on, be a devil and chuck 2 extra ones in there if its mainly for the drifting. Add 1 new one to the existing one (total of 2) if you want a decent predictable lsd for driving that spins up 2 wheels with ease. 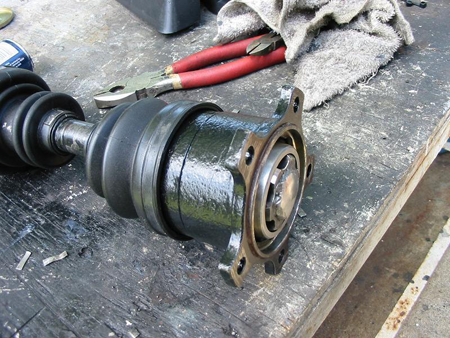 Comparable say to a BRAND NEW viscous diff (i.e. not worn out, you've probably never driven on one). 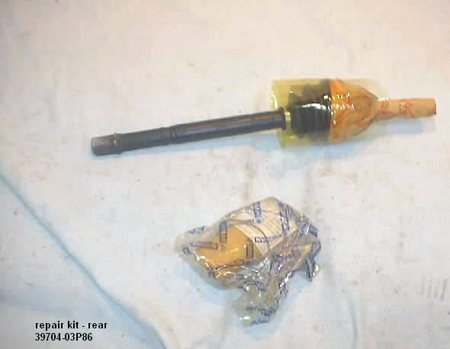 Add 2 extra preload shims to the existing one (total of 3) if you want a very solid diff that's very tight but not quite locked (comparable to say a kaaz 1.5 way mechanical). Before you screw the diff center back together after inserting shim, take the 'longer' of the 2 stub axles and insert it through the center of the diff all the way. This splines the 2 different splined parts of the diff center together so that when you go to insert the diff stubs at the end they'll actually fit (easiest way to explain it). 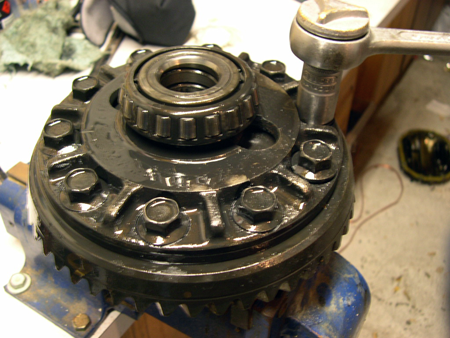 Also Pour new diff oil back in before you put the backing plate on. Hopefully the gasket for it is in alright condition, just use some high temp silicone to seal it before you bolt it up so it doesn't leak everywhere. More info on how that turned out at the end of this write-up. Lets start with some basic information. 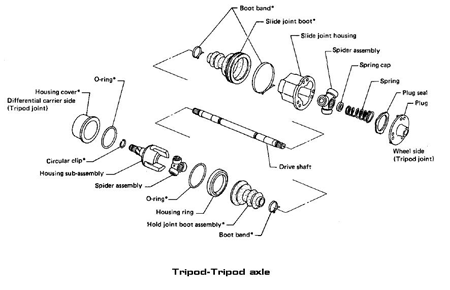 Z31 NA cars came with Tripod-Tripod half shafts and 6 bolt axle stub companion flanges and an open differential with either a 3.7:1 ratio (84-87) or a 3.9:1 ratio (88-89). 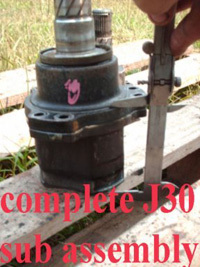 Late 94 to 96 J30’s came with Tripod-Tripod half shafts and 6 bolt flanges and had a Viscous type LSD with a 3.916 ratio. The R200V (VLSD) can also be found in NA Z32’s, 97-01 Q45’s, and some 240Sx’s. I currently don’t know what half shafts or ratios are used in those applications. This can be easily found by referring to the FSM of the vehicle in question. 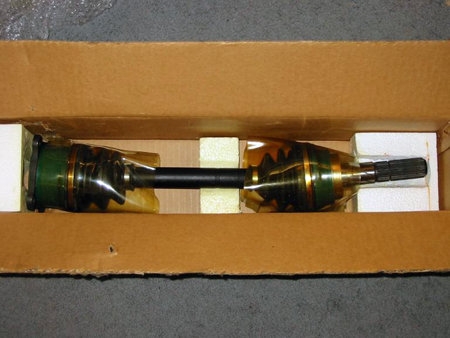 There are several ways to go about making your own hybrid VLSD half shafts. Due to time and cost constraints, I could only attempt one way. Lucky for you, fellow Z31performance members 88SinZ and Bemis gave information on their methods. A big thank you goes out to 88SinZ for Method 1, and to Bemis for Methods 2-4. The first way is to combine the Z31 NA half shafts and the L94-96 J30 half shafts. 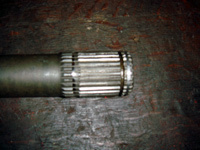 The diff side CV is removed from the J30 half shaft, and installed onto the diff side of the Z31 half shaft. Both Bemis and 88SinZ have completed this method. While 88SinZ has successfully installed these into his 88NA rear end, He suggests using 84-86 companion flanges (10mm shorter) for a bit of additional room. 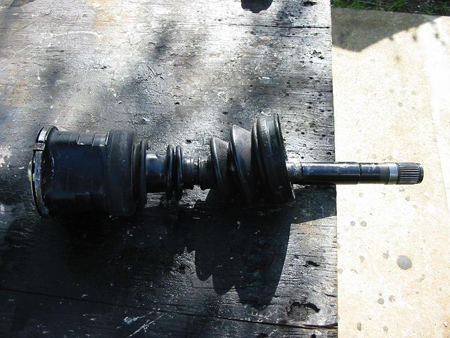 The second way to make hybrid axles is to use the 1988 SS VLSD axle rebuild kits offered from Nissan. There are two rebuild axles, one for each side. They are NLA from Nissan, but that doesn't mean that they are not sitting in some warehouse collecting dust. 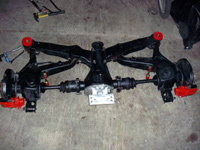 These hybrid axles are made by using Z31 turbo BDO axles. 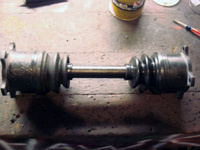 All you need to do is remove the existing outer CV joint on the original axle and fit it onto the 1988 SS rebuild axles. Now you have VLSD axles. 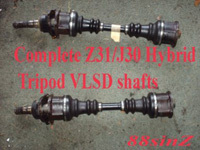 The third way to make hybrid VLSD axles for the Z31 it to purchase the original VLSD axle having the longer spline design and then have an original Z31 turbo axle machined to match the shorter spline design. It has to be done this way because you can always take away metal, but you can’t add it. 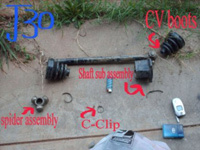 The original SS axles are no longer available (NLA) from Nissan, so good hunting. The fourth way to make hybrid VLSD axles, this being the most determined and bold method, is to once again use Z31 and J30 axles. Let's say I have an originally NA Z31, meaning that it has T-T axles and the complimentary 3x2 bolt hub companion flanges. I then get a J30 VLSD with BDO axles. 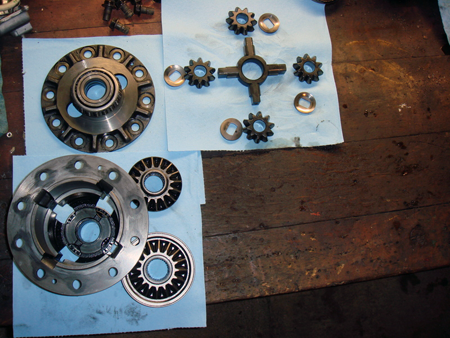 Technically, to make a working VLSD and half shafts out of this I will need Z31 turbo half shafts and the 4 bolt hub companion flanges, as mentioned above. But, I can't find any 4 bolt hub companion flanges locally and I really don't want to mess around with swapping them out. So, I decide to marry the two axles together. 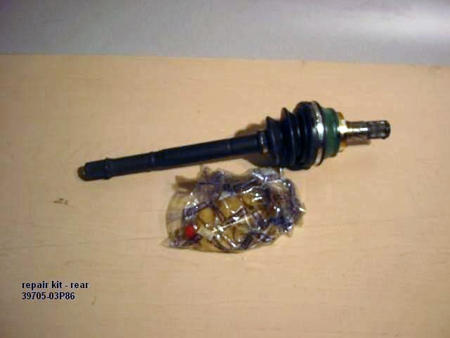 I took the Z31 NA half shaft, removed the inner CV joint, and joined the inner J30 CV joint on the axle. This was accomplished by welding the inner race onto the shaft. I decided to bring the inner race about 1.5 inches closer to the center of the shaft in order to make up the difference of length added by the J30 input shaft. Now I have a VLSD hybrid axle that will bolt up to the Z31 NA hub companion flange and connect to the 5 bolt input shaft of the J30 VLSD. The fifth way is to combine the Z31 Turbo half shafts (BDO type) and the 92-E94 J30 half shafts (BDO type). 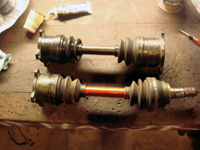 Once again, the diff side CV is removed from the J30 half shaft, and installed onto the diff side of the Z31 half shaft. This is the method that I chose for my hybrid half shaft assembly. My VLSD was pulled from a 93 J30. 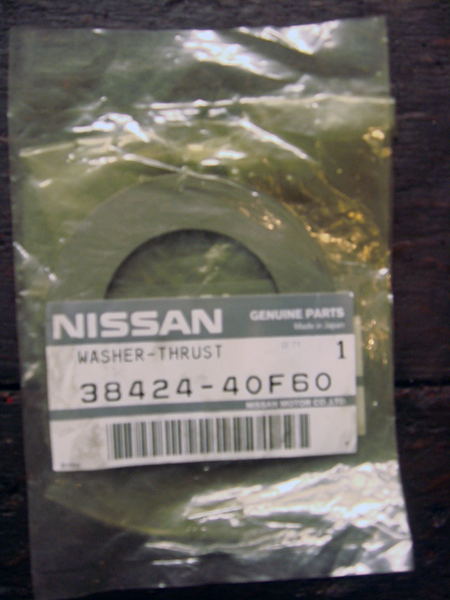 BUT I have a 87NA2T...This meant I would need Z31 Turbo half shafts and 4-bolt axle stub companion flanges to install the hybrid half shafts into my 87NA rear end. 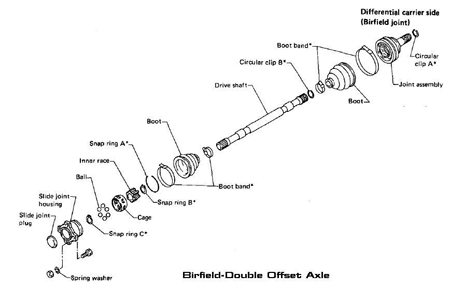 Note that it would have been much easier to use the L94-96 J30 half shafts and follow method 1. Instead, I made do with what I could get my hands on. Let’s start with a look at the types of retaining rings you will run into if you go the BDO route. 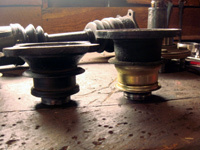 On the left is what I refer to as a stop ring. These retain the inner race from sliding inward on the half shaft. They are best removed using a stop ring pliers. Also, note that these are the only ring not available from the dealership (unless you buy an entire half shaft). 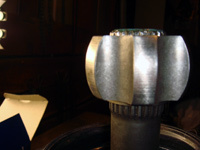 The big ring in the middle retains the slide joint housing. 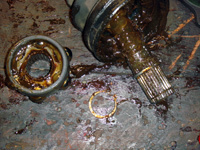 The small middle ring is what I refer to as a compression ring. These rings retain the stock Z31 turbo inner CV from sliding off of the half shaft. 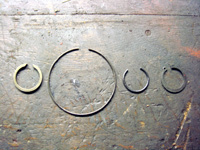 The ring on the right is referred to as a snap ring. They retain the Z31 turbo outer CV from sliding off of the half shaft, and also retain the J30 inner CV from sliding off of the half shaft. They are best removed using a snap ring pliers. 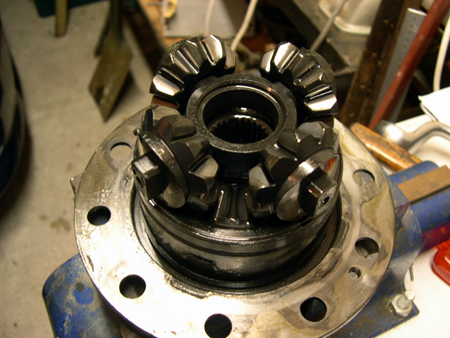 Disassemble the diff side CV of the Z31 Half shaft. BDO half shafts are simple. First remove the CV boot and clean all the nasty brown grease off. 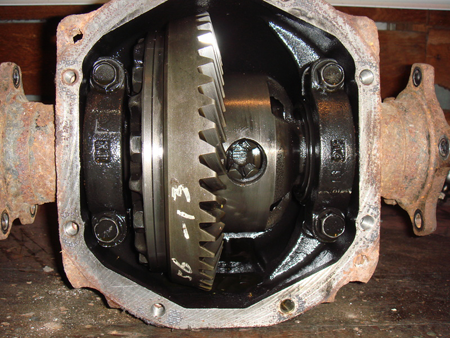 The diff side CV is held on by a compression style ring. Knock the CV solidly on its inner race with a big hammer. 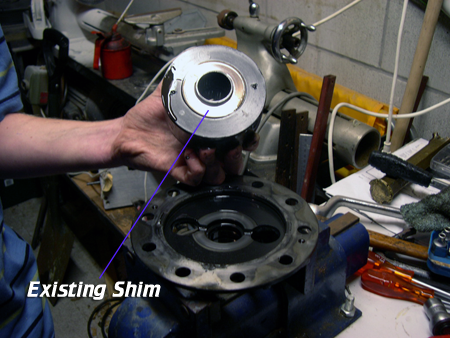 This forces the ring to compress, allowing the CV to slide over it and right off the shaft’s splines. While I had it apart, I decided to remove the wheel side CV of the Z31 half shaft as well for cleaning and greasing. In the end, I would have had to remove it anyways, because the cage needed to be turned around to shorten the overall length of the half shaft. This is explained later in the write-up. 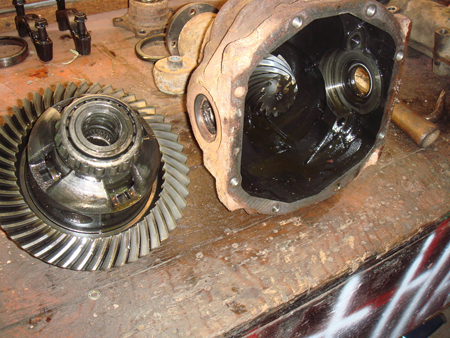 Disassemble the diff side of the J30 Half shaft. Remove the CV Boot and clean up the nasty green grease. 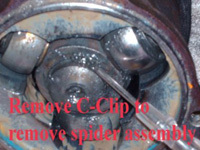 Remove the big snap ring from the slide joint housing with a screwdriver. Slide the slide joint housing off of the cage/ball/race assembly. Look at the end of the half shaft. 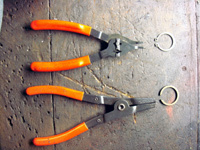 Using a snap ring pliers, remove the snap ring from the splined shaft and slide the cage/ball/race assembly off. It looks like this, except with green grease instead of brown. What comes next seems obvious. 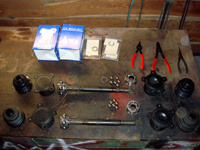 Simply slide the J30 diff side cage/ball/race assembly onto the diff side of the Z31 half shaft and reassemble everything. BUT WAIT! There's a surprise waiting for you. With the j30 assembly slid on, the outer snap ring groove is not visible! Once the machining is done you are ready for assembly. Install the J30 boot, stop ring, cage, inner race, and snap ring onto your newly milled shaft (diff side). 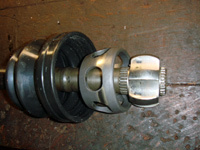 PLEASE NOTE: The cage as shown to the right, while installed in the factory position, resulted in a half shaft which was too long. For my application the cage needed to be turned around, resulting in a shorter length. This had to be done on both sides of the half shaft. Also, on the slide joint housings, you made need to tap out the cap a little bit. You may even need to grind a bit off of the end of the half shaft. Here are pictures of the cage turned around, in the position I needed. The next step is to pack the slide joint housing with grease. 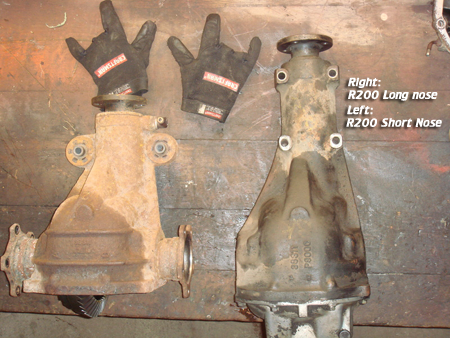 The Z31 housing, shown on the right, requires between 4 and 6 ounces of grease. 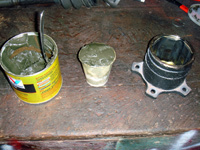 The J30 housing, shown on the left, requires between 6 and 8 ounces of grease. A standard Dixie cup holds 5 ounces. This was a handy way to measure out how much grease to use. 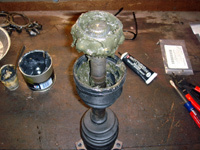 I used Valvoline Synthetic grease for CV axles. It’s best to test fit your axles before filling everything with grease. I learned that the hard way. 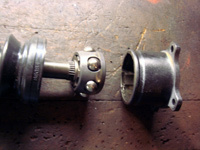 Assemble both the CV joints onto the half shaft. Once again, note that these pictures were taken with the cage in the OEM position. As you can see, 87-89 companion flanges are 10mm longer than 84-86 companion flanges. I used the 84-86 companion flanges for my setup, and this provided the needed room for the hybrid half shafts. Even with the extra 10mm of room, the shafts were a tight fit. First of all, the differential is a bit loud. Between 45 and 55 MPH a howling sound resonates through the cabin. 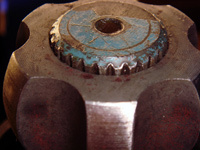 I attribute this to my backlash setting between the pinion and ring gears. I used the shims I had and set the backlash to .009”. The FSM says backlash should be .005” to .007”. The differential noise can also be attributed to my new polyurethane cross member bushings and differential mount. I am using Redline Shockproof Heavy Weight diff oil. I should note that after some break in time, the differential has quieted down a bit. Overall I am very happy with the results of this swap. I believe these methods to be among the cheapest and best methods for attaining LSD capabilities in a Z31. By using Junkyard parts, I was able to perform this swap for less that $125. Bemis Provided the information and images for the VLSD shim install, and the pictures and description for methods 2-4. He also wrote the addendums section.